Jammu is the winter capital of the state of Jammu and Kashmir. It is situated on the banks of the Tawi river. Jammu was the homeland of the Dogras who ruled over the entire state till 1947. Jammu is the second largest city in the state. Jammu covers an area of 20.36 square kms and situated at an altitude of 305 metres. This state holds the glorious history of the valiant kings, calmness of the lakes, greenery of the forests and amazing rivers. Although Jammu is considered as a stopover point for moving to higher regions of the Himalayas, there are some interesting places to visit in Jammu. Jammu is often known as the City of Temples due to the temples of Vaishno Devi, Raghunath Temple and Rambireshwar Temple. According to legend, the city of Jammu was founded by the 9th century king Jambu-lochan, after whom the city is named. This king is believed to have built the Bahu Fort overlooking the Tawi river. Under the Akbar's policy of conciliation and religious toleration, the Dogras became royal feudatories of the Mughal emperors. Until the late 18th century, the fortunes of Jammu were closely associated with the events in the Punjab. During the rule of the Ranjit Singh, the Dogras of Jammu were allowed a large degree of independence. Their ruler was the Gulab Singh. At the close of the Sikh War in 1846 and due to the treaty with the British he became the ruler of the combined states of Jammu and Kashmir. During the 18th and 19th centuries, there was a revival of arts, particularly in the field of paintings, under the Dogra rulers. Gulab Singh also wished to establish Jammu as a religious centre that compared favourably with the Varanasi. He commissioned the Rambireshwar temple, the largest Siva temple in north India. At partition, Hari Singh, the Maharaja of Kashmir, decided to side with India and as a result the state of Jammu and Kashmir was created. Lohri and Baisakhi are the main festivals which are celebrated in Jammu. Lohri is an important festival which is celebrated throughout North India in the month of January with havan and yagyas in temples and homes. Baisakhi is the harvest festival celebrated in the month of April. A large celebration is held at the Nagbani temple. The city of Jammu comprises of two distinct parts which are the Old Town that overlooks the Tawi river and the New Town. Some of the famous tourist attractions in Jammu are the Raghunath Temple, Bahu Fort, Art Gallery and Amar Mahal Museum. of the temple is gold plated. The other shrines have images of Vishnu in various incarnations, Siva and Surya. There is also a stone lingam here and is a great centre for the Shakti worship. The portrait of Ranbir Singh and a sculpture of Hanuman are situated at the entrance. 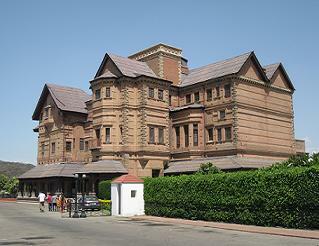 The Amar Mahal Museum was built by the Amar Singh in 1907. This museum is more like a French chateau with its sloping roofs and turrets. The museum was designed by a French man and overlooks the Tawi river. This museum has a very large collection of royal miniature paintings and manuscripts. The museum also has a portrait gallery which contains the portraits of ancient Dogra kings. belonging to the Pahari and Basholi schools, Terracottas, medieval weapons, sculptures and ancient manuscripts. The Bahu Fort is situated near the Amar Mahal museum. The ancient Bahu Fort is now in ruins and situated on the top of the hill, overlooking the Tawi river. The Bahu fort is one of the oldest building in the region and built by the king Jambu-lochan, who founded the city of Jammu. The Bahu fort was later improved and rebuilt as the Mondi Palace by the Dogra rulers. It is situated in the north east of the city and entered through a large quadrangle. The Kali temple is situated inside the fort. Its ramparts swarm with devotees during the festivals who come to pay their homage to goddess Kali. The Rambireshwar Temple is situated opposite the Dogra Art Gallery in Jammu. This temple is centrally located and dedicated to the Lord Shiva. This temple is a local landmark due to 75 m tower and has an extraordinary crystal linga. 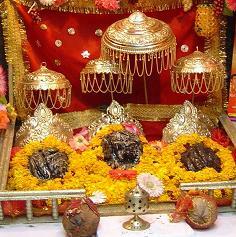 Vaishno Devi, the famous Hindu shrine is located about 48 kms. north of Jammu. This shrine attracts various pilgrims every year. Vaishno Devi is a cave situated at 1700 m and is 30 m long. This cave is dedicated to three mother goddesses of Hinduism. To reach the shrine, you have to must reach Katra, an attractive town situated at the foot of the Trikuta hills. From here, it is a 12 kms. climb to the cave temple. You can reach the shrine either on foot or by ponies. According to the legend, the goddess Vaishno Devi used the cave as a refuge where she was fleeing from the demon Bhairon who wanted to marry her. She was not interested with this and so she killed him. The devotees who visit the shrine of Vaishno Devi also visit the temple of Bhairon, who absolved for his sins, before he died. Akhnoor is the place where the Chenab river enters the plains. It is only 32 km. to the north-west of Jammu. This was the route which the Mughal kings took to reach Srinagar. Emperor Jahangir died here and was temporarily buried at a place called Chingas. This town is associated with the legend of Soni–Mahiwal, the lovers. The ruins of the Indus Valley Civilization, along the banks of river Chenab, can also be seen here. Surinsar and Mansar Lakes are located about 80 kms and 42 kms. east of Jammu. These lakes are situated in the picturesque forest setting. A religious festival is also held here annually. Kud is a small hill station and a popular lunch stop on the way to Srinagar. Several Indian visitors prefer to spend their holidays here. Kud is located about 103 kms from Jammu on the Jammu–Srinagar highway, at an altitude of 1,738 meters. Batote, another 12 km. ahead was an overnight stop for buses on way to Srinagar before the construction of the Jawahar Tunnel, which has made it possible for buses to reach Srinagar in 10 hours. Otherwise, the trip took almost two days. Patnitop is the another famous hill station in Jammu. Patnitop is located at a distance of about 110 kms from Jammu. Patnitop is perched on a beautiful plateau at a height of 2,024 mts on the Jammu–Srinagar highway. This place is enveloped by wooded forests. It is ideal for long walks, and a famous picnic spot and also offers breathtaking views of the mountains of the Chenab basin. During winter, skiing facilities are available here. Sanasar, a beautiful valley is situated at an altitude of 2079 metres, about 15 kms from Patnitop. It is a centre of nomadic Gujjar tribes during the summers. A golf–course is now being developed here. It also offers paragliding for adventure lovers. The Jawahar Tunnel links Jammu province with the Kashmir valley and is 2500 metres long. It is 200 km from Jammu and 93 km. from Srinagar. It has two passages for incoming and outgoing traffic. Before its construction, visitors had to take the longer route and during winter months, Kashmir was often cut off from the rest of India as the road was snowbound. When you emerge from the darkness, you will be in the verdant Vale of Kashmir. The Indian Airlines daily operates flight between Delhi and Jammu. The nearest international airport is located at Delhi. The nearest railway station is located at Jammu. Jammu is well-connected with Mumbai, Delhi, Jaipur and Calcutta. Jammu is located on the national highway 1A (Jalandhar - Srinagar - Uri) and linked beyond Jalandhar to Delhi by NH1. Jammu is connected to various destinations in Jammu and Kashmir by all-weather roads to Katra, Pathankot, Kishtwar and to Ladakh via Srinagar from May to October. To know the distances from Jammu click here.